Article first published as Pork Milanese on Blogcritics. Pork, how I love thee! Growing up Filipino meant pork was a prime meat in our diet. We easily had pork for dinner several times a week and my mom served it in all sorts of ways. Braised, boiled, roasted, pan fried, etc. But regardless of how my mom prepared it, it was always good. These days as I prepare meals for my family, I like to incorporate pork dishes at least once a week. 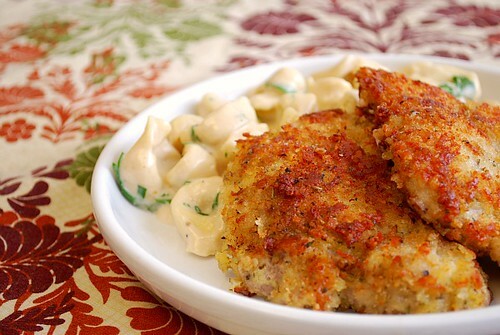 The most recent recipe I made calling for pork was this Pork Milanese. Coated in crispy panko with Parmesan cheese, this dish went perfectly well with cheese tortellini tossed in a Parmesan garlic sauce. If anything, this Pork Milanese is an Italian version of pork chops. The pork is pounded thin before dipping in beaten eggs and dredged in a panko and Parmesan coating. It's then pan fried and kept in a warm oven until all pork has been cooked and ready to serve. Because it's such a simple dish, it's wonderful for a weeknight but still elegant enough for company. Coarsely crush the panko into a large shallow bowl. Stir the cheese into the panko. Lightly beat the eggs in another large shallow bowl. Sprinkle the pork generously with salt and pepper. Dip the pork, 1 piece at a time, in the egg, allowing the excess to drip off, then dredge the pork in the crumb mixture, patting to coat completely. Place the pork on a small baking sheet. Heat 1/4 cup of oil in a heavy large skillet over medium-high heat. Add half of the pork to the hot oil and cook until golden brown and just cooked through, about 3 minutes per side. Transfer to paper towels to drain, then transfer them to a clean baking sheet and keep them warm in the oven. Add the remaining 3 tablespoons of oil to the skillet and fry the remaining pork. Transfer the pork to plates and serve with lemon wedges. Beautiful colors and I love that baked Parmesan smell. Sounds delicious!